“Romantic” and “affectionate” are not typically terms used to describe ravens, which are commonly associated with mystery and death. However, as we learn more about the lives of these intelligent birds, we find that their social and inner worlds are not just complex, but may also be highly emotional. One piece of evidence is that they mate for life. For a bird that can live for more than 40 years, that’s a lot of commitment to a life partner. How do they form such committed bonds, and why? Common Ravens have one of the earliest mating seasons, beginning in January, but they do not breed until they are 2-4 years old. Prior to choosing a mate, juvenile ravens usually roam around in “teenage gangs,” subsisting in large flocks until they have the opportunity to establish their own territory. This is a stressful time for ravens who prefer to give their time and energy to just one bird. Courtship rituals are just as diverse as the individual bird. The gestures the male uses to impress the object of his desire tells his potential mate “these are my best features.” These include acrobatic feats of flight, bringing gifts of food, and dance performances. Competing males have been observed taking turns diving off cliffs, tumbling to the ground in an airborne game of chicken, swooping up as close to the ground as possible while a female intently watches. Once she is keen on a male, the elaborate courtship continues so they get to know each other better before mating. Partners are observed going on what can only be described as joy flights, tumbling and soaring, even locking toes and somersaulting in mid-air. They balance wild dates with down time, caressing beaks, preening one another, and cooing soothing comfort sounds to the other. By February or March, mates have built a nest in their established territory and lay between three and seven eggs. While hatchlings usually leave the nest after about 40 days, they stay with mom and dad for about two more months, learning how to hunt, forage and cache. Though they are devoted parents, pairs are even more devoted to each other. They do nearly everything together the rest of their lives, breeding in the same territory yearly. Even in roosts of hundreds or thousands of birds, raven pairs are usually never far apart for the night. Although sexual infidelity is sometimes observed, ravens rarely “divorce,” finding new partners only if one dies. For this reason, courtship rituals are a rare thrill for people to witness. Ravens are not completely unsociable, alerting other ravens to food sources when it is beneficial to them. Still, they work best in pairs. As long-term partners, ravens seems to have intimate knowledge of the other which helps them survive. Pairs have been known to team up against other birds, one distracting an eagle or fellow raven while the other raids the nest or cache. Between foraging, mischief-making, and play, raven pairs continue to make time for romance outside of mating season. Partners regularly give each other special treats and go on romantic flights, gliding wing tip to wing tip to cement their relationship. Valentine’s Day and its historic predecessor, the Roman fertility festival Lupercalia, may be celebrated in mid-February because of the timing of birds’ mating seasons. 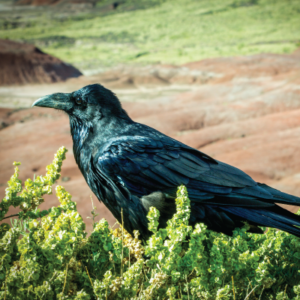 Did the Romans notice how romantic ravens could be, and get inspired? Maybe. If you do see a raven this season, take note because it is probably doing something worth watching. It might just give you ideas for your own season of love and romance! Hannah Irwin is the Community Programs Manager at Walking Mountains Science Center and loves all birds great and small.